We constructed the silkworm gene set from 11,104 full-length cDNAs, 408,172 expressed sequence tags (ESTs), 2,089 publicly available mRNA sequences and 16,625 gene models. An overview of the procedures is depicted in the the image below. The transcripts except gene models were aligned to the silkworm scaffold (Build2) using NCBI-BLAST and est2genome. Based on the information of aligned positions, transcrips were grouped into 16,823 gene sites (Gene set A). 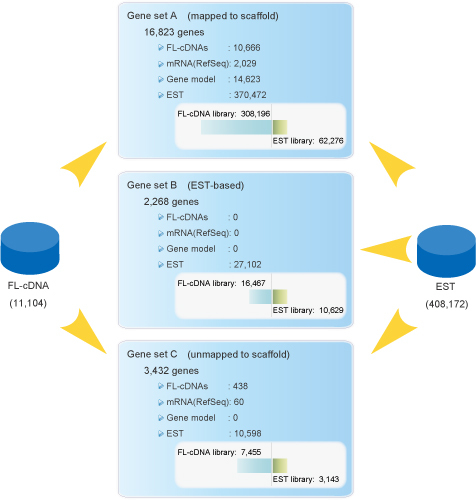 The ESTs, that were successfully aligned to the genome, could not align to Gene set A (27,102 ESTs) were also grouped into 7,240 genes (Gene set B; EST-based genes). 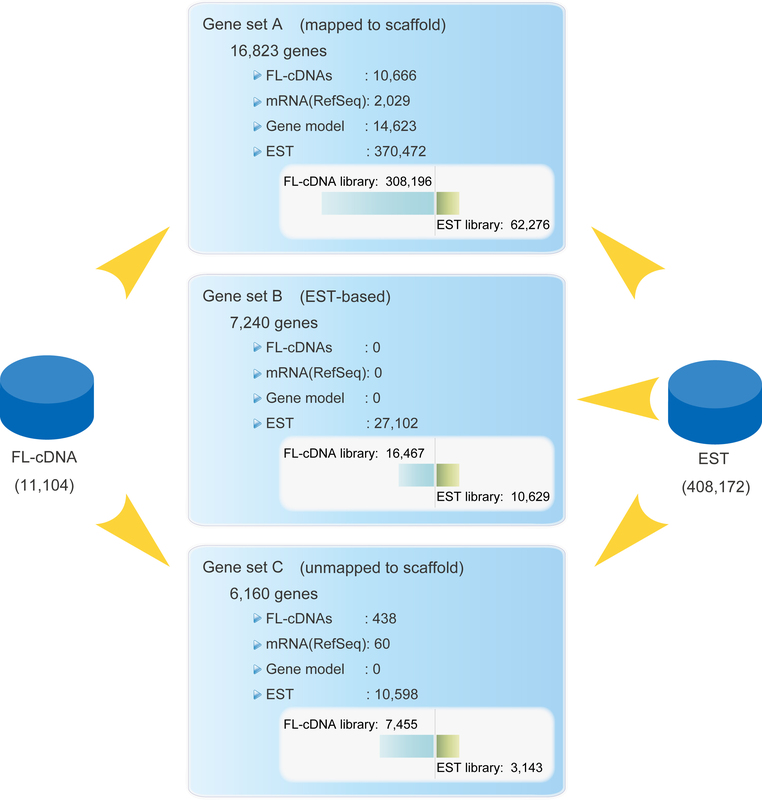 The Gene-IDs for Gene set B are prefixed with "e". All the transcripts that could not align to genomic sequence were assembled into 6,160 contigs with CLOBB2. These contigs were named as Gene set C.
Geneset-A GFF3 file (scaffold): Features have start and stop coodinates based on scaffold coordinate system. Geneset-A GFF3 file (scaffold, with Flybase-ID): Features have start and stop coodinates based on scaffold coordinate system. Homologous Flybase protein ID is added. Geneset-A GFF3 file (chromosome): Features have start and stop coodinates based on chromosome coodinate system. Geneset-A GFF3 file (chromosome, with Flybase-ID): Features have start and stop coodinates based on chromosome coordinate system. Homologous Flybase protein ID is added. Geneset-B GFF3 file (scaffold): Features have start and stop coodinates based on scaffold coordinate system. Geneset-B GFF3 file (scaffold, with Flybase-ID): Features have start and stop coodinates based on scaffold coodinate system. Homologous Flybase protein ID is added. Geneset-B GFF3 file (chromosome): Features have start and stop coodinates b ased on chromosome coodinate system. Geneset-B GFF3 file (chromosome, with Flybase-ID): Features have start and stop coodinates based on chromosome coodinate system. Homologous Flybase protein ID is added. Geneset-A table file: All genes in Geneset-A are listed with annotation information, including conserved domains, homologous Drosophila proteins and GO terms. Geneset-B table file: All genes in Geneset-B are listed with annotation information, including conserved domains, homologous Drosophila proteins and GO terms. Geneset-C table file: All genes in Geneset-C are listed with annotation information, including conserved domains, homologous Drosophila proteins and GO terms. Copyright (C) National Institute of Agrobiological Sciences. All Rights Reserved.